From the Warp: Do you paint using only one color at a time? Do you paint using only one color at a time? The other day when I posted my Nurgle Cultist troop, I mentioned mixing the washes when I shaded him. I wanted to expand on that idea today and talk more about breaking out of the one color at a time mindset. I'm willing to bet you, like me, paint using one color at a time. In fact, I'm willing to bet it's what 99 percent of us do. It's probably how we were taught and it's certainly how GW explains the painting process to us with the new Base, Shade and Layer paints. I even do it myself. I work with one color for the base and then move to a darker shade of that same color for the shadows and then a lighter version of that very same color for the highlight. What makes this weird for me is that I'm used to using multiple colors or mixes of multiple colors at a time instead of sticking to shades of just one color. I did it all the time in art school. 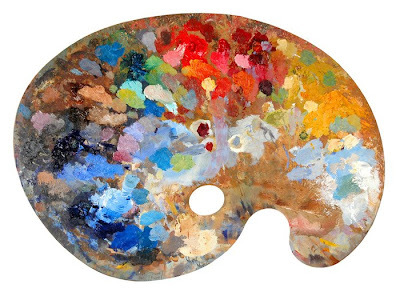 My oil painting palette was a sea of colors that you could never get by painting one color at a time. The variety of shades and hues is endless once you start using multiple colors instead of shades/tints of one particular color. This is what we are missing on our models. This is what you see on some of the higher end model painting out there. The subtle blending of numerous colors to give a wonderful look to a model. You can see it (additional techniques to introduce a variety of colors into our models) starting to work their way into our painting today. Folks are starting to use different primer colors on models (and by that, I mean something other than black or white), zenithal highlighting creates wonderful value changes to show light and dark surfaces on a model and people are starting to learn that Agrax Earthshade for all it's great qualities is not the best wash on the planet. Try using green or blue to shade red armour, the effect can be quite nice and it doesn't turn out as flat looking as it would if you'd used just black. His left arm is another good example. If you look at it in the pic above, it's green, but has a pink hue at the top, a green tint in the middle and is somewhat brown at his hand. 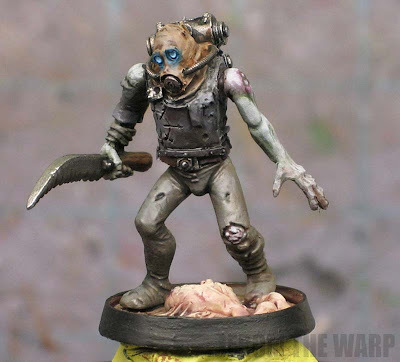 My Nurgle Cultist model is my best example of this to date. Had I just used one wash for the shading, he would have never turned out like this. If I'd painted his shirt the same base color and then washed it with just Agrax Earthshade or just Nuln Oil, the final effect would not be anywhere near the same. Now I'm not saying that you need to use multiple colors/washes/layers/whatever and if you don't, your model is junk. I'm saying that it's worth trying. 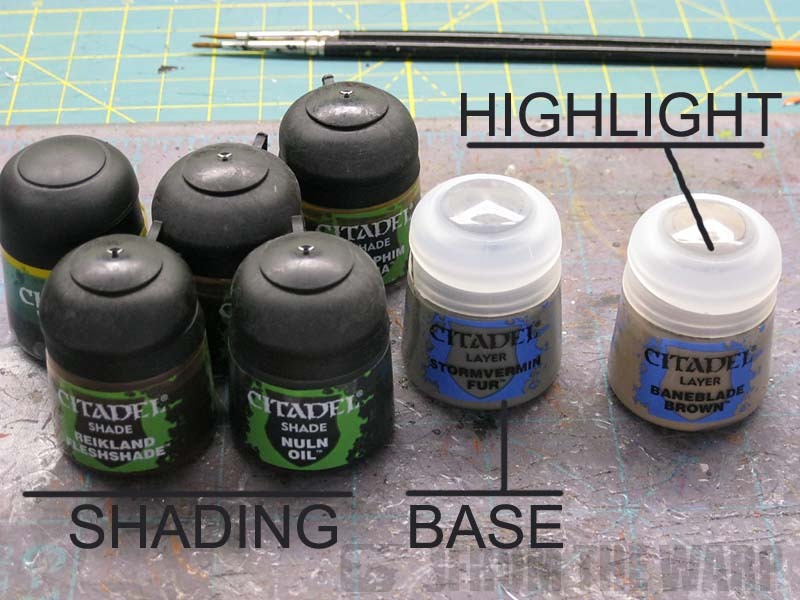 Try shading your base colors with more than just one shade. 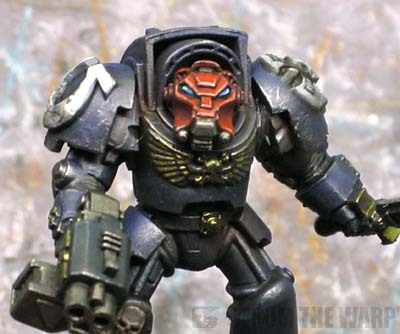 Try painting a red helmet with something other than bright red for the highlight and Carroburg Crimson for the shading. This is what a "red" helmet looks like when you shade it with Agrax Earthshade, Carroburg Crimson and then highlight with a bright red and give it a final line highlight using Ushabti Bone. It's not a big step, but it's a little change that makes a big difference in the final look. It's still red, but the use of a tan color for the final line highlight gives the helmet a completely different look than if I'd just used another shade of red. You don't have to go far with paint to get an improvement. Try a slightly different color for a final highlight to see what the effect is on your next model. You might be pleasantly surprised. Very, very smart post man! I usually use lots and lots of colors when i paint, diferent washes to darken ( violets and greens and blues) washes here and there to slightly change the "feelling " of the model...As usaid , it´s not that painting plain red the red parts or plain blue the blue parts will make a mini rubbish , not at all. But since color is light the hues are endless and using them helps to move the mini away from the "toyish"look( With ALLrespect , some of the GW models have that look to me) and more into the "real mini world"
Great post. I read a post of James Wappel the other day and i believe this topic is his bread and butter. I Think you just introduced us to the next level of painting at a brand new world. I would love to see this in a step by step tutorial with pro's and con's included. It's easier to do the multicolor blending on the model with natural tones. Like on bases or large vehicle weathering - or Nurgle's followers ;) That is always a good place to start if you want to try it out because the natural colors are more forgiving. SO next time you weather a tank or flyer have a few browns greens and yellows out and when you wash or stipple do it right on the tank while the paint is still wet. Animal fur/ hair are also a good place to try it out due to their natural tones. Mr. Wappel has a great example of it on his site this week with the eagle he is doing and you can still see the wet paint in each step! Amazing post. GW should hire you to do an advanced "how to paint Citadel Miniatures" book. Your insights and advice are fantastic, easy to understand, and very useful. Agreed. I'm always posting links on my blog to your tutorials. It's really the greatest thing you do, simple, straight forward, step by step that makes it easy for anyone to try something new. Keep up the great work. I appreciate that, but I';m just trying to share what I figure out about figure painting as I go along myself. Re painting the red helmet: I have been painting red power armor by first washing with a light brown wash (Ogryn Flesh from the old range) followed by a red wash (Baal Red from the old range). I have not tried my hand with any new GW paints but I'm kind of confident the method you used is similar. The idea is simple, if you give a color, any color, especially a bright color, a brown shade followed by a shade of its own color, then re highlighting it brings out a very saturated but dark and realistic look, even on flat areas (I have used this method on dreadnoughts). I don't know how much of this is common sense, but I thought I would share it. I think the major reason that people paint with one color at a time has to do with the drying time of acrylics. Until you put a wet palette together for painting, most people I know consider it too difficult to reliably mx colors. It is also a time investment to learn a new skill which some may not have. I don't think glazes is the answer here. Glazes do give the model a "painting" layer, even when you thin them. Medium is a better solution, so i agree with Zab here buy a medium. I've used mediums before. The corners still dry out super fast. If you want to reliably mix colors that you plan to use across several models or even large models, and keep them pliant enough to paint with you really need a wet palette. Retarders change the consistency of the paint and sometimes make it difficult to work with... and Medium can change mixing ratios and opacity of color as it dilutes down the pigment. Maybe I just haven't met enough people who actually like to paint the miniatures and mostly get by with straight single color blocks. When I saw this article my first thought was, good luck getting enough time out of your paint to use multiple colors, or, i suppose you could just run through paint like crazy by mixing up tons at a time. 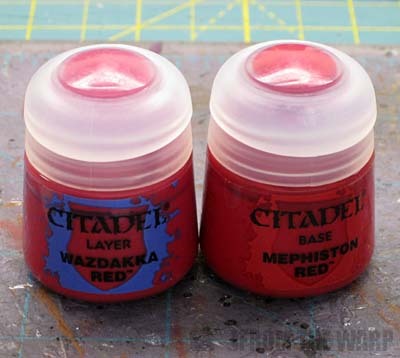 Granted the article is focusing on basics (and if you were to, say, use like 4 or 5 pots of GW colors instead of mixing your own, such as wet blending the washes), but there really is very little reason not to make a wet palette. All it takes is a sponge and some parchment paper, and it really allows you to mix up several colors, keeping a base, 1-2 highlights and a shade mixed and available for blending. Sadly while I understand the concept, I'm still not there yet. Its incredibly hard to teach how to do even the basics of highly detailed painting in writing. Excellent, I'm glad this post hit a home run with everyone. Next time I paint up a model incorporating this concept, I'll try and go through the process step by step to show my thoughts behind the technique. I'm glad folks liked this topic! I tried that awhile ago on a Privateer Press trollblood model. Used purple as base color, shading with a bit of yellow, highlight with white, then followed by a red glaze... really gave a rich purple/red color (what i was aiming for), nothing close to what i was used to paint. Another attempt i did was painting Yellow with a purple shade... its weird how these color ends up working well together. Great article. There's so much you can do playing with washes and the colours that the glazes can bring to the complete picture. I particpate in a Sunday night painting group and was having a similar discussion with a friend just this evening. I'd recently played around with some plague bearer models and had struggled with trying to harmonize the red and greens that were the root colurs of the sickly skin and festering boils. Initially I'd muted the colours (more beige/cream) but ended up glazing the model entirely in yellow. It smoothed the transitions and added a warmth that made the brushwork worth more than the sum of it's parts. Old school wash mentality tells us we can bring out details and save ourselves painting time. Washes/ glazes can also allow us to balance, adjust tones with a subtlety that never ceases to amaze me. i wish it had all the images. probably the coolest red armor ive ever seen. Well said and I completely agree. Like anything it's hard to break out of a habit but that's what separates good painters from great painters. I'll be honest folks. I don't have a wet palette and I don't use any mediums or retarders either. All the work I do on my models to this point is without the benefit of those extras. I am trying to expand slowly though and hope to incorporate them into my painting at some point in the future. I always read your blog. I really like what you do. compliments. Ron - This is an excellent post. Using tan to highlight red is a brilliant idea and one that I am planning on using when I paint my 3rd Ed Space Hulk models. I am almost done with my retro purple and blue Genestealers and I have been peeking at your other posts that chronicle your painting of said figures. Thanks again for the tip. Your blog and painting are always inspiring, beautiful and thought-provoking. Keep up the good work! SquadPainter: You made a very good point in your deleted comment. There comes a point when you have to decide on how much work your are going to invest in a model. A horde army may not get the same level of detail a Grey Knight force might receive. Sometimes (when you're looking at 100 plus models), it's easier to keep it super simple. I'm glad you've been able to use the tips here for your Space Hulk models. Ron - Crap. I was hoping that you wouldn't see that reply. Ha ha! After I wrote it I realized that I went down a rabbit trail instead of following your article more closely. I saw the mixing palette and jumped to the thought, "How in the heck would I ever finish a model if I was using all of those subtle color shades?" As I was hitting ENTER I realized that you were advocating using different colors to shade and highlight... which is something that I agree with. I always enjoy experimenting. I am just finishing up a free-handed Space Wolves logo on a Space Hulk Genestealer figure that turned out much better than I was expecting. I'll have pix up in the next day or so on my blog. I see all of the stuff that gets posted by way of email so I can keep up on the conversations. No problem. Glad to hear your freehanding went well. Yeah guilty of charge I tend to only use one color of shade and most often the ones I'm used to working with...so I guess I'll give a try at adding more colors to my washes. Great article well worth the read! I've just been playing around with this myself. I tried using dark blue as a shade for red and I've had lots of complements on it and surprised looks when I explain that I have used blue as a shadow for the cool/warm contrast. It seems to give a lot richer tone than black shading. I've also tried using a very saturated colour wash to paint on shadows rather than to wash the whole area. EG beiltan green rather than camo shade on a muted green cloak gives an interesting effect. Finally I've been making washes/glazes out of normal GW paintsby watering them down a lot. This allows me to build up some subtle colour variations. I discovered this when trying to learn how to paint NMM silver and gold. For examples see this wood elf I recently painted. Malthus: We're all gu8ilty of it. This is just to suggest to folks that it's worth trying other colors for different looks. rob82: Very nice. I love using blue and green to shade red. It keeps it from looking flat in the shaded areas and you often get those subtle color changes too. Hey Ron just finished the model using blue to shade red and tan to highlight it. I've also done a walkthrough of the method I used.